Home renovations have become a consequence of the home purchase process. Most homebuyers are intimidated by the entire concept of remodeling which is why they are looking for homes where those updates have already been completed. For sellers, you may not want to deal with the pain of hiring the right people, lack of visibility to costs, as well as the time and disturbance it will cause. A good real estate agent will help you navigate the entire process, from suggesting vendors to coordinating completion dates. Having more transparency to the process can be helpful so these costs don’t come as a surprise. A homeowner’s recognition of their home’s value is almost always skewed. Even though you may think that your home and it’s decor is the most expensive compared to your neighbors, it is more based on the current market. The actual value of your home is based on market forces: supply and demand. The amount you spent on your home, how you decorated or what you need to net has nothing to do with it. The majority of sellers are hesitant to have their homes professionally staged; they would rather sell for less and stay on the market longer than make a small upfront investment. If your home is unorganized and cluttered with outdated fixtures then it will be less attractive to buyers. A seller should find the preparation of getting their home ready to sell to be more of an investment and not an expense. Many times individuals who are planning an upcoming sale start the process too late. This process consists of meeting with agents, establishing list price, preparing the home for sale, and getting contractors to come out to complete updates. The process should always start at least three months in advance so you have plenty of time to get everything accomplished. If you’re not preparing early, you’re already late. Sellers should purchase a pre-listing inspection and make repairs in advance. The reason being, that you don’t want to agree to a price, only to find out later that a seller-obligated expensive repair must be made, or even unexpectedly becoming aware of a hidden defect and having the buyer walk. You should provide the inspection and proof of repair to a potential buyer. As a result of this, they will often skip another inspection altogether saving you time and money. There are many times where sellers will be concerned about the amount of traffic coming through their open houses. 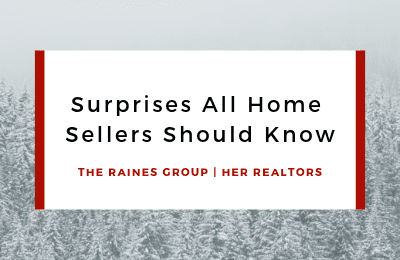 Most often, qualified traffic to their home tends to be the buyers who come outside of the open houses, with their agents. Open houses typically draw in neighbors and individuals who want to take a look inside your home without the intention of purchasing it. The majority of traffic outside of the open houses tends to come from more serious buyers who were pleased with what they saw online, are pre-approved, and are ready for the next steps toward a closure. If you have any questions about selling a home, call us today at 614.855.8700!